By reading this description you will be able to answer some of the questions. Salt is one of earths most useful and abundant minerals. It is known as Sodium Chloride (NaCl), and is made up of one sodium ion and one chloride ion. Salt helps to regulate and control normal body functions, acts as a building block for more complex chemicals and it is essential to human health. The use of salt has evolved over the centuries and its applications and uses are many, from an ancient preservative for food to keeping our modern roads clear of hazardous ice and snow. The value of salt is well documented throughout history, having held a similar economic value to gold within society. Caravans trekking through the desert traded salt ounce for ounce for gold and Roman soldiers were partly paid in salt as part of their wages. Past wars have even been fought over the control of salt. Many societies and religions have references to the importance of salt and some of these references are still used today. It is common to hear someone of value referred to as being worth their salt and it is a Jewish tradition to give a gift of bread and salt to a new home within the community. The origins of salt on our planet go back to when the Earth was formed. Salt can be found all around us in underground deposits, although our biggest source of salt is to be found in our seas and oceans, where rock deposits have been eroded over the course of time and entered the seas and oceans. Salt is generally harvested in 3 ways; rock salt mining, vacuum evaporation or solar evaporation. Going North from Play Blanca you come to Laguna de Janubio, a large, emerald green saltwater lagoon and the location of the Salinas de Janubio, the only remaining operating commercial salt works on the island and the largest in the entire Canarian archipelago. 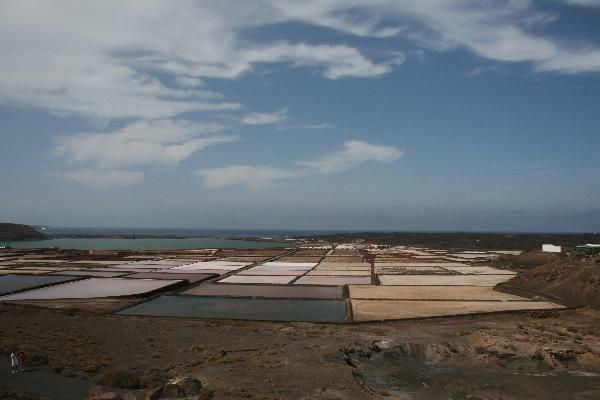 Originally the Salinas de Janubio was a natural lagoon. Over the course of time, the lagoon became isolated from the sea and was formed by a build up of volcanic deposits laid down by repeated volcanic eruptions from the Timanfaya volcanoes. As this happened, dried salt deposits would have started to form naturally through a process called Solar Evaporation, which basically means seawater captured in the shallow ponds of the lagoon would gradually evaporate with exposure to the sun and wind both of which the Canary Islands have in abundance! 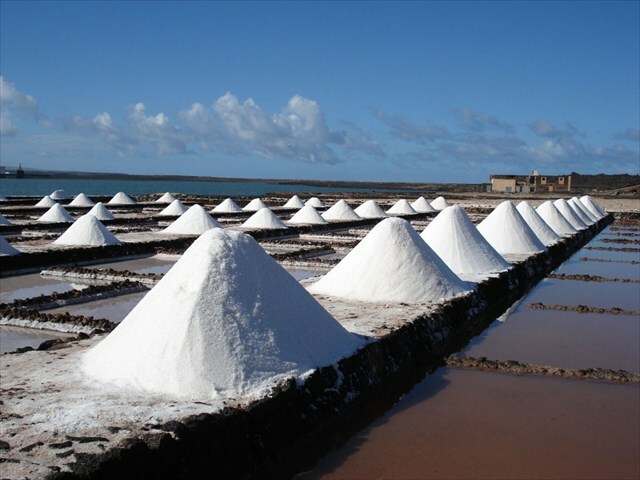 The salt from Salina de Janubio was in high demand locally primarily used by the local fish industry to preserve and process the catch before the advent of refrigerators and freezers. At the beginning of the 20th century the saline worker Victor Fernandez helped to create the current structure of the Janubio saltworks, turning this natural resource into a major industry. Laid out in a geometric pattern with each of the saltpans showing a different colour (depending on the amount of water in the saltpan), the Salinas resembles a huge work of art. The marine salt was produced by pumping seawater into the saltpans using the windmills. The windmill power was later replaced by electric pumps but the windmills themselves still remain and keep silent watch over the saltpans. Once the saltpans are flooded, the natural process of Solar Evaporation is still used to produce high quality salt and depending on the time of your visit, you may see some of the huge pyramid piles of salt, awaiting the next part of the process. The salt is usually harvested once a year when the salt reaches a specific thickness. After harvest, the salt is washed, drained, cleaned and refined. This is the purest way to harvest salt, often resulting in nearly 100 percent sodium chloride. Only areas with low annual rainfall and high evaporation rates - Mediterranean countries and Australia, for example - can have successful solar evaporation plants. The unique climate of the Canary Islands with its year-round warmth, low rainfall and trade winds make it an excellent place to produce and harvest sea salt. At its height, the Salinas produced around 10,000 tons of sea salt per year although this has decreased considerably to around 2,000 tons a year. Today the Salinas is sustained by the European Union as an excellent example of salt production and the produce is sold as high quality table salt. During the Corpus Christi festival in June, tons of dyed salt from the Salinas is traditionally used to create amazing decorations in the streets and squares of the islands capital, Arrecife. You can easily view the entire Salinas from the viewing point as there are restrictions on entering what is still a working plant, although you can walk down the slope for a much closer view of the Salinas. There is a small carpark at the viewing point and unless you decide to walk down the slope (if you can, its worth the walk back up), then this cache is accessible to wheelchair users and those pushing prams. The object of this Earthcache is to learn about one of the Islands natural resources, how it is farmed and how salt has played a vital role both historically and salts continued importance within modern society. Once you have received email confirmation from us that your answers are correct, you can log the cache along with your photo.